Tirta Empul, the beautiful holy springs temple, one of the six most important temple in Bali located in the village of Tampak Siring, Gianyar Regency, about 36 km north of Denpasar. There is something magical about this place, especially in the early morning, peaceful and at the same time incredible attractive and divine. This place is really a must if you’re on Bali. Easily accessible by public transportation from Ubud. Or you can hire a car. There is car park outside the temple but crowded by small shops selling crafts and souvenirs. 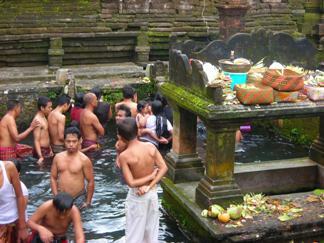 According to the legend, this sacred spring was created by God Indra during his battle with Mayadanawa, the evil. The nearby river has been poisoned by this evil and made hundreds of Indri’s troops sick. God Indra pierced the earth and creates a fountain of immortality to recover his troops. 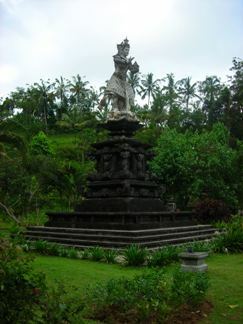 In the temple complex, you can see the statue of God Indra, very beautiful actually. 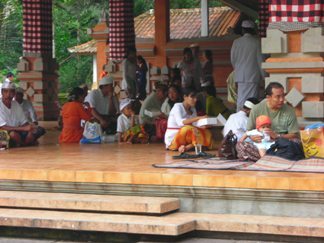 And for more than thousand years, Balinese people come to this place to bathe in the sacred waters for healing and to cleanse themselves spiritually. The water is considered to be the holiest water on the island. The springs are also a source of Pakrisan River, which rushes by Mount Kawi, one km away. The springs bubble up into a large, crystal clear tank within the temple and flow out through the waterspouts into a bathing pool, the water is fresh and cold. Each spout has a separate purpose, like for cure illness, prosperity, and for pregnancy. There are also two specific waterspouts intended for the dead. Bathing serves a sacred purpose and follows a ritual of offerings, prayers and blessing. The most bathers are guided by a priest on which spouts to bathe and in what order. There are protocols inside temple. Not everybody can bathe in the pools. Tourists are not allowed doing bath here. 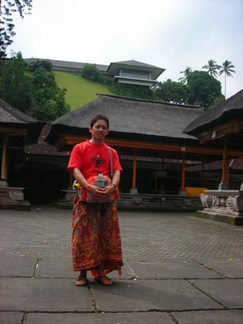 And you have to wear sarong or scarf which you can hire at the temple. 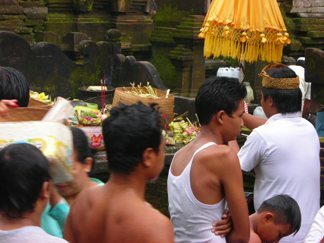 After bathing, people gathered in the main courtyard to pray en receive some rice and holy water. Praying is not for the show, but you still allowed in the main courtyard, as long as you stay at side lines. 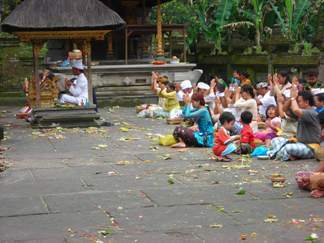 Tirta Empul has traditional Balinese split gate named Candi Bentar. At the gate there are also shrines for Shiva, Vishnu, Braham and Indra. This is a large temple complex, built around the springs. There is a large open pavilion in the main courtyard, and use by people to have some break. 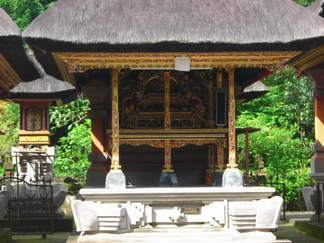 On the hilltop above Tirta Empul sits the palace of Indonesia’s first president, Soekarno, the Istana Negara Palace. It’s a modern building, designed by Soekarno himself. It’s sometimes open for the public.